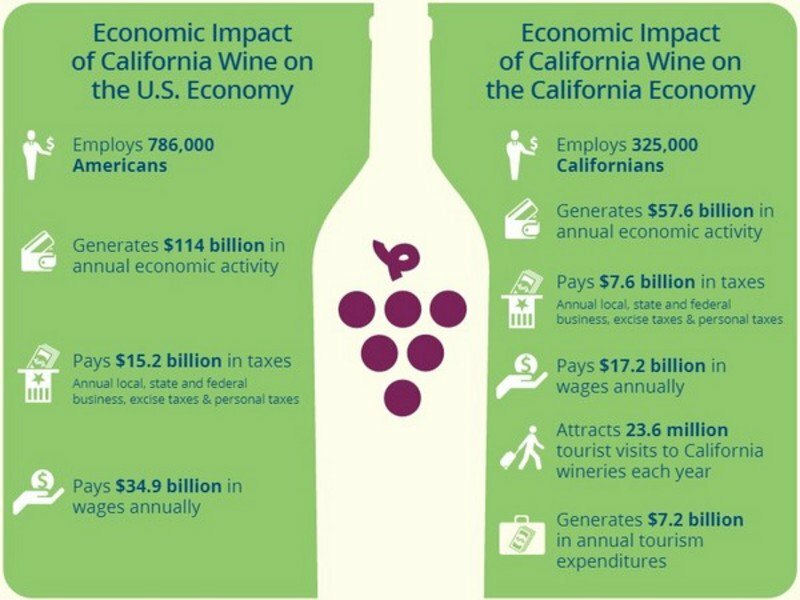 2015 Annual Economic Impact Grows to $57.6 Billion in California, $114.1 Billion in U.S.
San Francisco—The California wine and winegrape sector and allied businesses deliver a total economic contribution of $57.6 billion annually to the state’s economy and $114.1 billion annually to the U.S. economy according to a new report commissioned by Wine Institute and the California Association of Winegrape Growers. California wineries and vineyards also directly and indirectly generate 325,000 jobs in California and 786,000 jobs across the nation. The report, “The Economic Impact of California Wine and Grapes 2015” prepared by John Dunham & Associates of New York, was presented today at a Joint Informational Hearing of the California Assembly Committee on Agriculture and Assembly Select Committee on Wine held at UC Davis. The report shows growth of 17% in statewide impact (from $49.2 to $57.6 billion) and 19% in national impact (from $96.0 to $114.1 billion) in the past seven years. This strong growth during a period that started with the Great Recession and continued with slow recovery shows the strength and resiliency of the nation’s number one wine-producing state as a positive economic force across the nation. John Dunham & Associates used new methodology for the 2015 report and has also adjusted the 2008 economic impact numbers so that the comparison in growth would be comparable. The report measures the full economic impact of the wine and grape industries in terms of employment, wages, taxes, tourism spending and visits, and charitable giving. It uses a standard and widely used methodology which includes direct, indirect and induced economic impact in order to present the full picture. The IMPLAN model, developed by the U.S. Forest Service and University of Minnesota, is used by many companies around the world as well as government agencies such as the National Agricultural Statistics Service, Economic Research Service and Federal Reserve Bank. For a copy of the methodology, click here. Click here to download Statistical Highlights of California Wine 2015. CAWG provides industry leadership to advocate for public policies, research and education programs, and sustainable farming practices to enhance the business of growing California winegrapes. The organization represents the growers of more than 50 percent of the gross grape tonnage crushed for wine and concentrate in California. For more information, visit www.cawg.org. Established in 1934, Wine Institute is the public policy advocacy group of nearly 1,000 California wineries and affiliated businesses that initiates and advocates state, federal and international public policy to enhance the ability to responsibly produce, promote and enjoy wine. The organization works to improve the economic and environmental health of its communities and the state through sustainable winegrowing and winemaking practices and partnerships with Visit California and California Grown to showcase California’s wine and food offerings. Wine Institute membership represents 85 percent of U.S. wine production and 90 percent of U.S. wine exports. Visit: www.wineinstitute.org.